Tree Sparrows are generally more common in the winter at Cedar Creek than are juncos, but are not nearly as abundant in migration. In winter, tree sparrows occur along the plowed county roads, and in some of the fields and savannah areas. Chipping Sparrows at Cedar Creek frequently nest in evergreens, but occur in fields where such nest sites are rare or absent, and are also found in the pine woods north of Cedar Bog Lake. 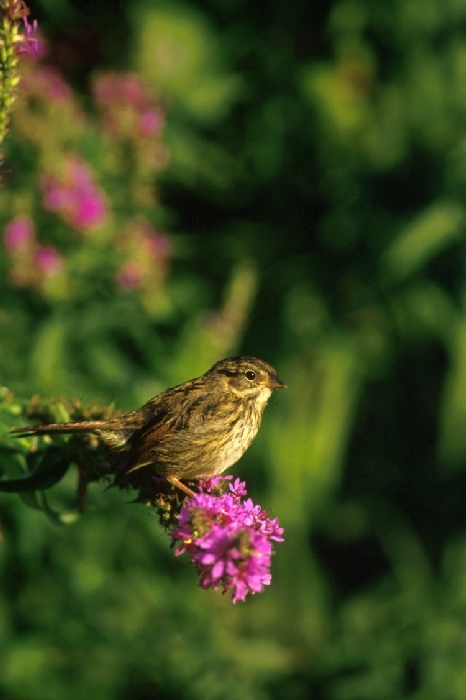 They occur in many of the same fields as do Vesper and Field Sparrows. 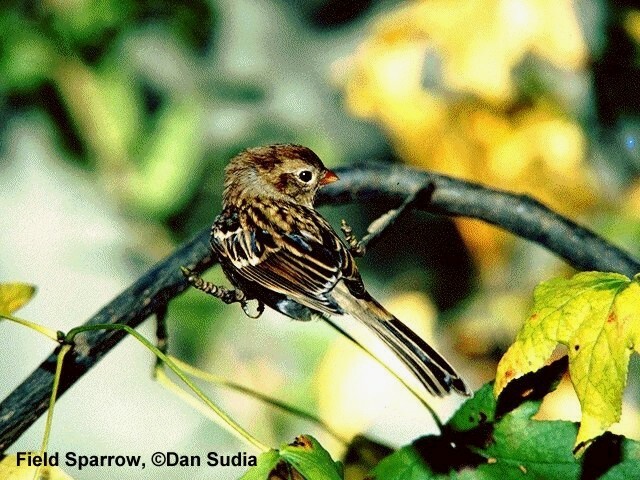 Clay-colored Sparrows are rare to uncommon, but regular at Cedar Creek. They nest in the Christmas tree plantation west of Allison Savannah, and also have been found at the west end of the field west of East Bethel Boulevard 1.2 km north of 26. Juncos are abundant spring and fall migrants at Cedar Creek. They are usually not common on the area in winter, but are common at feeders in the vicinity. There are no summer records. Field Sparrows are among the most abundant breeding birds at Cedar Creek. They breed in fields and oak savannahs, nesting on the ground or near the ground in small trees, bushes, or vines. 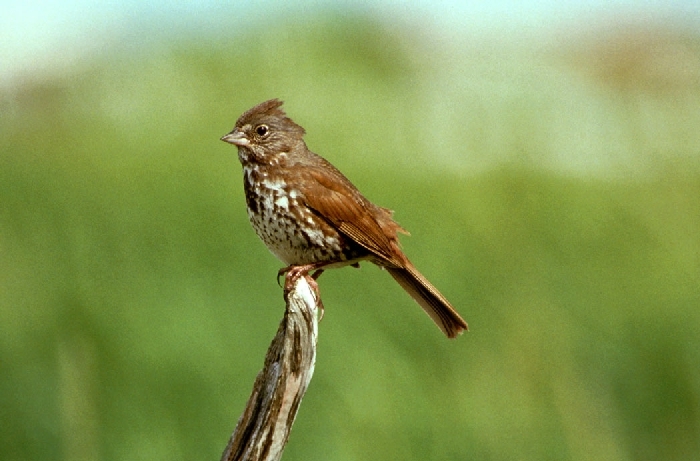 Fox Sparrows are common migrants at Cedar Creek. Grasshopper Sparrows are not common at Cedar Creek. They occur in the fields between Fish Lake and East Bethel Boulevard and in the fields south of 24 east of the lab. Harris' Sparrow is a rare migrant at Cedar Creek. The only records are two birds east of the north-south road on May 3, 1974, a bird near the laboratory on May 11, 1978, and a bird by the resident biologist's house on May 15, 1980, one in a marsh west of East Bethel Boulevard on May 23, 1990, and a bird on May 17, 1995. Lark Sparrows are so easily seen at Cedar Creek that it is surprising that they are so much less common elsewhere in the state. Lark Sparrows are most abundant in the Allison Savannah, the Christmas tree plantation to its west, and the savannah portion of Cedar Creek to its north. They also are common in the fields just north of the laboratory. Their nesting success appears to be good. 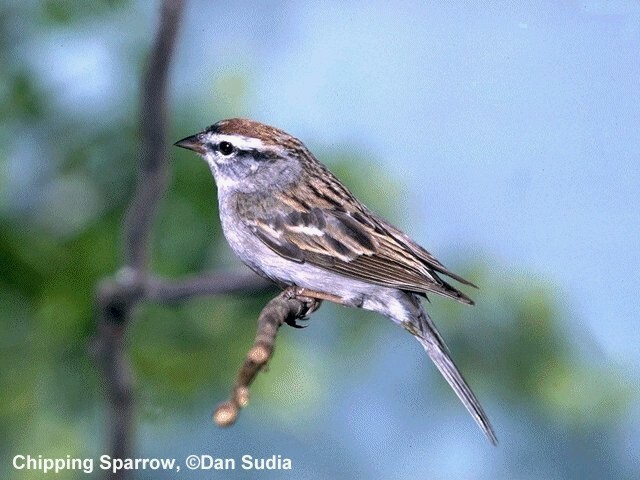 Lincoln's Sparrows are rare migrants at Cedar Creek. They have occurred along the path to Cedar Bog Lake. 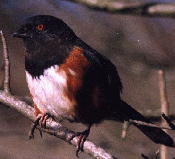 Towhees are relatively common at Cedar Creek and breed where openings occur in the oak woodlands and in the savannahs. Savannah Sparrows are common in the agricultural fields west of the duck pens. 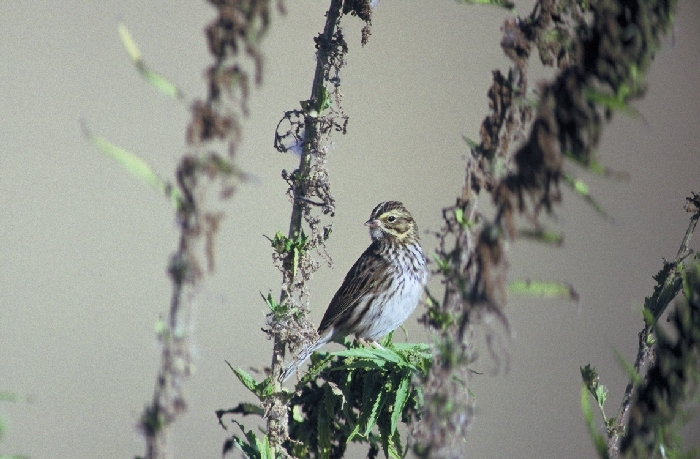 The only record of a Savannah Sparrow on Cedar Creek property is a bird in the field southeast of Fish Lake on May 25, 1986. 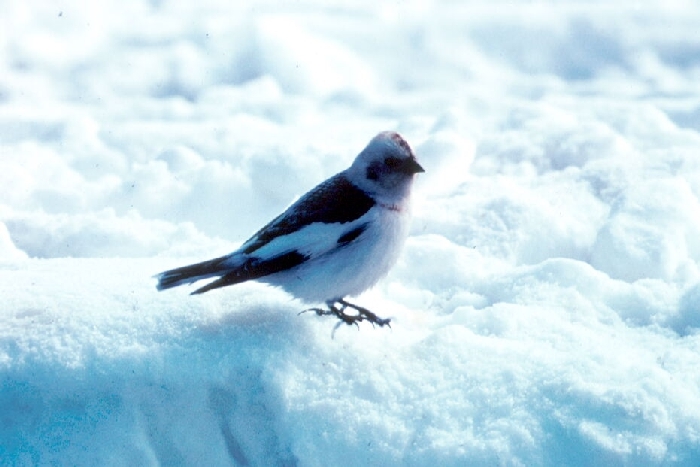 Snow Buntings are uncommon winter visitors at Cedar Creek, occurring in large flocks in the fields along the county roads. Song Sparrows are common to abundant breeding birds in the moist areas of grasses and sedges at Cedar Creek. They sometimes conceal their nests in hummocks or under a downed limb. Swamp Sparrows are common breeding birds along the edges of many of the marshes at Cedar Creek, notably the large marshes west and south of Fish Lake. Vesper Sparrows commonly breed in the short grass fields at Cedar Creek, especially those with patches of bare ground. 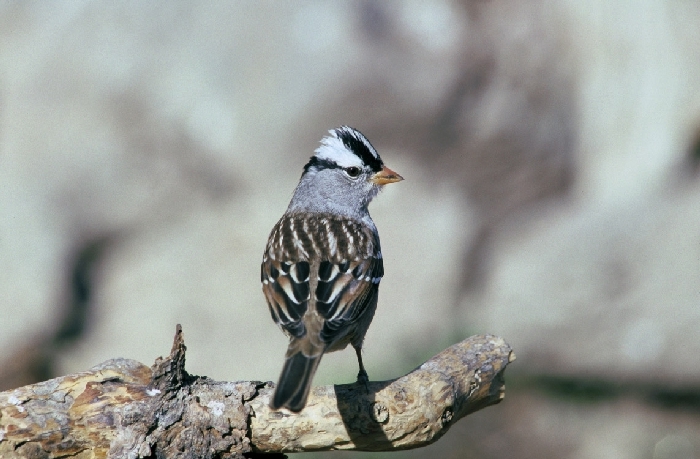 White-crowned Sparrows are uncommon migrants at Cedar Creek. None have been recorded in the last 20 years, strange for a bird that breeds across Canada and is so abundant in the West. White-throated Sparrows are abundant spring and fall migrants at Cedar Creek, especially in bushy areas. 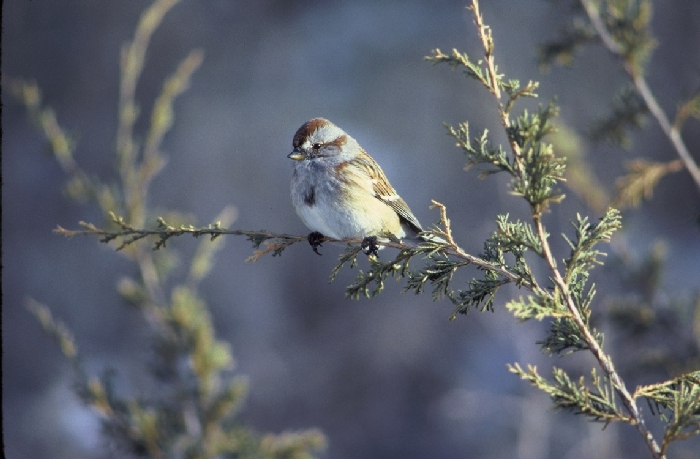 White-throated Sparrows have been found in the bogs around Cedar Bog Lake during the breeding season, but appear to have declined there since the study of Breckenridge (1955).